Rocky Cape National Park is locate on the North West Coast of Tasmania. The park has a plethora of walking tracks for the casual to hardened bushwalker. Amongst the winding tracks you’ll find The Rocky Cape lighthouse, standing proud with its sweeping views. There is much more to see if you take the time. Aboriginal heritage, ship wrecks, rock formations turned sideways, beautiful hills running down to the sea and an incredible variety of flowering plants. It makes the many corners of this small park worth closer inspection. The Stanley Visitor Centre is available to make your booking for you. on the beach and shell deposits and rock pools at low tide are worth exploring. The Retreats are more than a bed for the night but a destination in their own right. The Retreats are conveniently located 20 minutes’ drive west of Burnie airport and the same again east to the popular destination of Stanley. Provisions for both continental and cooked breakfasts are complimentary for each day of your stay and because we value your privacy there is no daily servicing of the units but extra towels etc. are available on request. Both units feature king sized beds, heated floor tiles, a separate kitchen/dining/lounge and a heat pump/air conditioner for your comfort. It is a couple’s only retreat and is not suitable for children or infants, pets are not permitted and because the property facilities are for the sole use of resident guests, day visitors are not allowed. Both Retreats are smoke free but an ashtray is provided for out on the deck. Set on over 200 acres of north facing coastal vegetation the 2 Retreats offer a perfect destination to relax, unwind and recharge. 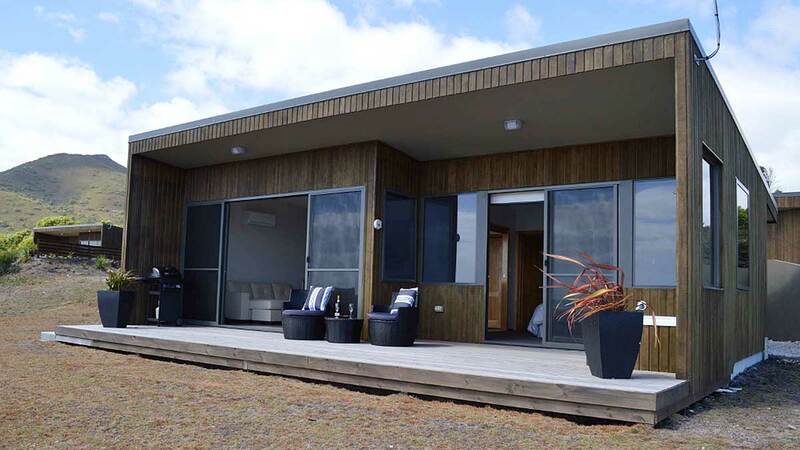 The modern , contemporary, self-contained units have a separate bedroom and ensuite, with access out onto a deck that features a 2 person bath where you can relax with a glass of wine and listen to nothing but the sounds of the waves breaking along the foreshore.